Azerbaijani music was developing through the centuries. The traces of ancient music of Azerbaijan were found in a number of monuments, excavated in time of archeological digs, as well as in rock carvings of Gobustan (18-3 millennium B.C) and Gemigaya (3-1 millennium B.C). Kitabi Dede Gorgud (8th century), creative works of Nizami, Fizuli provide full coverage of medieval music art, music genres and music instruments. The records of such prominent medieval scientists of Azerbaijan as Sefiaddin Urmevi (18 century), Abdulgadir Maragai (17 century), Mir Movsum Nevvab (19 century) pointed out the highly developed art and culture of music and mastery performance and cited theoretical issues of music in medieval Azerbaijan. The first written monument of our country epos Kitabi Dede Gorgut , containing several chapters, related to music and citing the names of different musical instruments, testifies that out music art possesses ancient history. A booklet “About Music” by Mirza Bey is one of the interesting works, created in South Azerbaijan in early 17th century. Beginning in late 19th century music meetings, associations and circles (by Mahmud Agha in Shamakhy, Kharrat oghly , Mir Movsum Nevvab in Shusha, Meshedi Malik Mansur in Baku). In the 1880th M.M.Nevvab and Hadjy Husu organized meetings of Musicians, which were dedicated to discussion of esthetic problems of music, mastery performance and mugam . Meetings were attended by famous singers and saz players Meshedi Djemil Amirov, I.Abdullayev, S.Shushinskiy, Sadykhdjan and others. Hadji Husu, progeny of Kharrat Gulu, is one of the great representatives of vocalism of Shusha. He studied mugam , improved a number of them and created new mugam s. Mirza Sadyg Esed ogly was a maestro of tar of the 19th century, he reconstructed tar and created the tar of modern type. Meshedi Zeynal , Meshedi Djamil Amirov, Shirin Akhundov, Gurban Primov were all representatives of this art. There are a number of cities in the world, which absorbed music by its stones, tower and its atmosphere. These are Vienna (Austria), Neapol (Italy) and Shusha (Karabakh, Azerbaijan). There exist a popular saying that infants in Shusha even cry under the music of mugam . Prominent representatives of the Shusha Caucasus Conservatoire successfully represented Azeri music and glorified it all over the world. Meshedi Djamil Amirov, Qurban Pirimov, composers Uzeyir Hadjybeyov, Zulfugar Hadjybeyov, Fikret Amirov, Niyazi, Afrasiyab Bedelbeyli, Soltan Hadjibeyov, Ashraf Abbasov, Suleyman Aleskerov, and singer Rashid Behbudov. Yet this list is not a complete list of musicians of Shusha. Labor songs are the most ancient of genres of folklore music. The most famous are those devoted to cattle-breeding sayachi songs, while the most popular songs among plant-growers are hovaly labor songs. The most ancient songs are “Choban Avazy”, “Tutu nenem”, “Saghim mahnisi”, “Chichek shumla yeri”, etc. Household songs are divided into nursery songs, humoristic songs and satiric and lyrical songs, according to their content, form and feelings expressed. Nursery songs, especially those sang by mothers to their children -lullaby songs are the most ancient ones among all other household songs. Lullaby songs comprise ninnies, layla and okhshama. Lyrical songs became the most important means of people’s self-expression. Some of these songs are optimistic, while others are sad, and full of sorrow. The specific feature of the first group of lyrical songs is a lively rhythm, segah style, while the second group is characterized by such exclamations as “Ah”, “Vay”, the style of “Bayaty Shiraz” and alternation of 6/8 and ? times, etc. The first group includes such songs as “Gul oghlan”, “Yaz bize gonag geledjek”, “Qoy gulum gelsin”, etc; the second group comprises “Senden mene yar olmaz”, “Onu deme zalym yar”, etc. Lyrical songs are of more complex form. They are characterized by a couplet form, form, analogous to rondo form and complex two part form, repetition of verses, sequentism , etc. Epic-historical and heroic songs also occupy an important place among the folklore songs of Azerbaijan. These songs, that have been created since ancient times are devoted to historical events, taking place in Azeri people’s life or people’s heroes, which played a great role in the life of people. Eposes and songs about Qachaq Nebi, Qachaq Kerem, Deli Aly and other characters were also composed. These include such songs as “Geden gelmedi”, “Piyada Koroghlu”, “Gachag Nebi”, etc. Dances. Dance music, along with favorite genre of music, is one of the widely spread and important components of national folklore music. Folklore dances are basis of the Azeri national instrumental music. The dances are created by the people and passes through generations. Instrumental folklore dance music of Azerbaijan is characterized by richness of music, symmetric structure, diversity of diapason, gradual intensification, repetition, variation and method of sequence. Dances are distinguished by specific tune, metro-rhythmic properties and colorful forms. Like folklore songs, dances also reflect people’s feelings, emotions, character and temperament. Dances of women are specific for their lyricism, tenderness and grace, for example “Vaghzaly”, “Uzundere”. A number of dances can be performed only by women, “Nelbeki”, “Djeyrany”. Male dances are characterized by stormy emotions, energetic rhythm, power and temperament. These are “Qaytaghy”, “Djengy”, “Qazaghy”, “Khanchobany”, etc. Collective dances are also popular among the population. Most of them accompany working process and household ceremonies. The dance “Halay” is one of these dances. Vaghzaly usually accompanies weddings. The dance “Yordu-yordu” can be performed by both men and women. The most ancient collective dance is a widely spread “Yally”, which dates back to ancient times. The improvisation of Azeri mugams is more frequent and brighter compared with mugams of other people. Therefore, professional performers of mugam are also the authors of this type of mugam. Zerbi-mugam is another type of instrumental vocal mugams of Azeri people. This includes “Heyraty”, “Arazbary”, “Ovshar”, “Mansuriyya”, “Shimai-shems”, “Keremi”, “Kesme-Shikeste”, “Garabag-shikestesi”. The peculiarity of these mugams is that the improvised part of a vocal mugam of a singer is performed on the exact metrorythmic accompaniment.At the same time a def or a def and a drum occupy an important place in the accompaniement by a saz trio. The saying mugams of vocal parts are characterized with a melody of a rich a rich ornament starting from the highest diapason. Creative activity of Ashugs. Beside mugams, professional oral traditions of the music of Azerbaijan include the musical and poetical creative activity of ashugs. The wotd “ashu” is derived from the word “eshg” (“love”) and means the devotedness to one’s profession. As a term it developed in the 14th century. The art of ashugs, which emerged in ancient times was popular among the people as it praised the wishes and expectations of people. The epos, devoted to the national hero of 16th century, fighter against feudal and foreign occupants, a man of courage Koroghlu, is famous worldwide. The heroism of Koroghlu was glorified in “Koroghlu djengisi”, “Atly Koroghlu”, “Piyada Koroghlu”, “Koroghlu”, and other ashug songs of the epos. The heroic song “Misri”glorified the period of the most intensive competition between ashugs. Two, three even four ashug may take part in the competition and improvise on a definite topic. Praises and gozellemes are the most famous components of the lyrical genre of the art of ashugs. These gozellemes may be dedicated to either a beautiful women or to the man of counrage Koroghlu or his legendary horse Girat. The most wonderful patterns of the ashug lyricism are lively songs as “Afshary”, “Sherili” and others that are usually full of sorrow such as “Yanyg Keremi” and “Dilgemi”. Azeri ahugs are distributed among definite zones and differ due to the local characteristics of ashug’s art. For example, ashugs of Goyche, Ganja, Kelbedjar, Gazakh, Tovuz, Borchaly, Shirvan, Salyan differe in their creations and purposefully preserve and secure traditions of their personal creative activity. In ancient times and in Middle Ages Agugs were called “ozan”, “Varsag”, “dede”. Through centuries the ozan-ashug creations of Azerbaijan influenced on other fields, kinds of musical genre and later on the creative activity of modern composers. U.Hadjibeyov was the first to use the unrivaled properties of Ashug music with great professionalism and skill (opera “Koroghlu” the masterpiece, composed by U.Hadjibeyov). Another composer Gara Garayev created the synthesis of technical means of modern music and ashug music also with a great skill in the second part of the third symphony. Musical instruments of our nation are distinguished for richness and diversity. Many of them were made in the ancient times and have been improved throughout the centuries. ‘Tambourine player stone’ near Gobustan rock paintings of 6000 years was used by our ancestors as a percussion instrument. Various musical instruments engraved on items found during archeological excavations in Azerbaijan indicate to their antiquity. 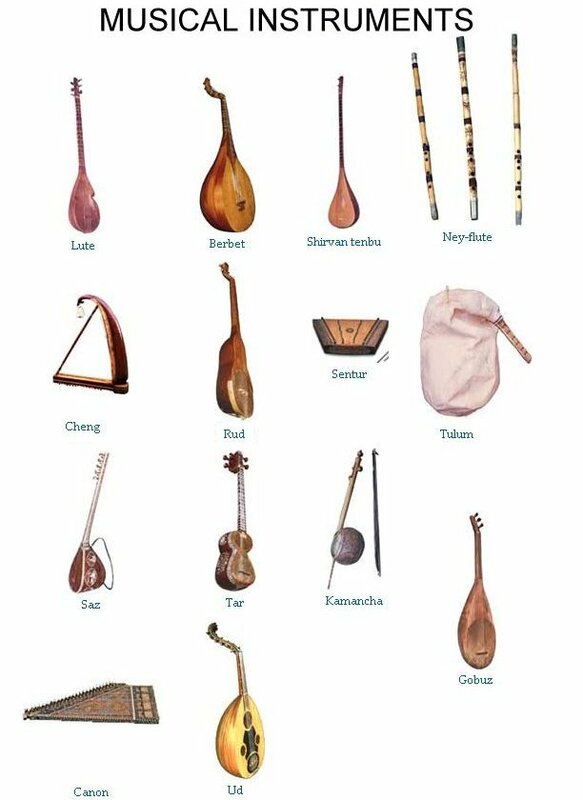 Governed by tangible cultural riches, works by our classic poets, booklets by music experts, miniatures by artists of Middle Ages, wall paintings, diaries of travelers having travelled our country, museum collections, we can say nearly 90 musical instruments have been used in Azerbaijan. They are divided into 5 groups according to the sound source, the basis of modern classification: string, wind, percussion, self sounding. 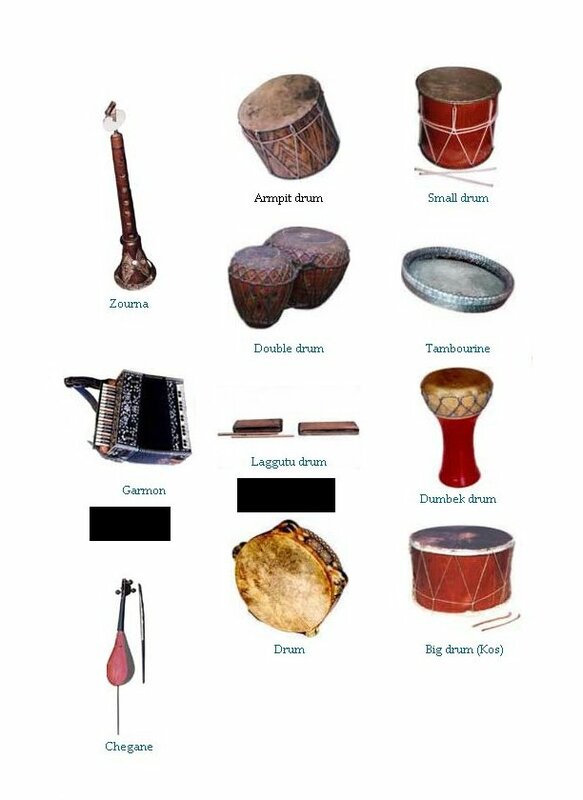 In accordance with this classification, out of instruments distributed in Azerbaijan 32 (26 played with mediator, 4 with bow, 2 with switch) are string, 23 wind, 16 percussion, 17 self-sounding. Tar, ‘the most important instrument for expansion of study of Eastern music’ to Uzeyir Hajibeyov, kamancha, which he considered ‘the most beautiful of melodic instruments’, saz, the ‘friend’ of ashygs, ganun that was compared with ‘box of secret’ by Fuzuli, oud, the ‘king’ of all instruments in due time, are most popular string instruments at present. Tar, one of the most perfect instruments of Azeri nation, is played with mediator. Tar is made of mulberry, walnut and pear trees, open side of the body is made of cattle heart membrane. Its strings are of different thickness and composition. Tar that has passed through long development is mentioned in poems by Baba Tahir and Gatran Tebrizi of XI century. Capital improvement of tar is linked to the name of Mirza Sadyg Asad, the skilful tar player. Before him tar had 5 strings. He added tune and ring strings, kept 22 frets, specified their place, clinched ‘inner arm’ to the body to reinforce tuning. Tar, which became lighter, was held not on lap as before but on chest. Thus, technical opportunities of tar were expanded. For short time Mirza Asad’s tar got popularity beyond Azerbaijan under the name ‘Azerbaijani tar’. Divided into big and small bowls, body of tar reminds from the top of figure of eight. 22 frets are linked to its fingerboard. The instrument has 11 metal strings, which are called white (made of metal with steel mixture), yellow (bronze) and red (white strings covered with reddish or yellowy bronze string) strings. 2 double strings (white and yellow) in the very bottom are main strings, since sound of melody is produced by them. They are followed by tune strings consisted of double – red (sometimes yellow) and white (can be replaced by yellow too) strings, and above them there is thick red – bass tune, tone string. Above tune strings there are 2 couples of white ring strings. Main and ring strings are tied to 6 big tuning pegs on the top, while tune ones to small tuning pegs. Double white, yellow and ring strings have permanent tune. 3 tune strings are tuned to various loudness respective of mode of mugham or composition. During performance, mediator is used in different methods. Kamancha of ancient times had a string, long fingerboard and foot. Now, it has 4 strings, third and fourth bass strings of which are covered with copper and bronze wires. Strings are played with bow made of cornel tree in the form of slightly bended switch and horsehair in the end. It consists of ball-shaped bowl made of walnut tree basically, round fingerboard and iron billow called ‘spit’ that unites them and crosses through bowl. Open side of bowl is covered with sturgeon skin. Stretcher is placed on that in the aslant position. One ends of strings based on stretcher are tied to hooks on the spit, while other ends to tuning pegs on the upper side of fingerboard. Saz, development of which is closely linked to the art of ashyg, is played with tazana (mediator). It is often mentioned in poems by classic poets and ashygs. Primitive saz had small bowl and 2-3 strings. In the course of ashyg music, measures of saz were enlarged, number of strings and frets increased. Pear-shaped deep bowl of saz is made of 9 mulberry tree strips. Its fingerboard is made of walnut tree. Saz has kinds such as large or big (8-11 strings), medium (8-9 strings) and short (4-7 strings), armpit. 1500-mm, 12-string major large or mother saz was used in the near past. 17-18 and more frets are tied to its fingerboard. 3-4 lower strings are high-tone, 2-3 middle strings are bass and 2-4 upper strings are accompaniment. High-tone and accompaniment strings have permanent tune, while tune of bass strings changes according to mode-harmony of composition. Ganun is played on the lap by plucking the strings with two tortoise-shell picks, one in each hand, or by the fingernails. It was widely spread in the East, including Azerbaijan in due time. After being forgotten for some time, in the late 50s orchestras began playing it again. Ganun’s body is in the shape of flat right-angeled trapezium. Cover is made of wood mainly, has resonator holes on the surface. Lower part of the cover is coated with skin, on which wooden barrow is placed. 72 strings made of metal or kapron are stretched over the barrow. One ends of strings are tied to holes on the right-angeled side of the body, while other ends to wooden tuning pegs. Tuning the instrument, tuning pegs are screwed with special key. One or two small metal barrows are placed near tuning pegs, under strings to change tune of strings up to half tone or a tone and a half. Oud, one of ancient instruments played with a feather of eagle, comes from ‘al-ud’, which is called ‘lyutnya’ by Russians, ‘laot’ by Germans, ‘lyuto’ by Italians. Till X century oud had 4 strings, later the fifth one was added and every string was doubled to make sound louder. Brought to Sicily and Spain first oud was spread in whole Europe in Middle Ages. XVII – XVIII was renaissance of oud, which gradually lost its popularity, giving up its place to violin, guitar. Only in the eastern countries it kept superiority. Present oud consists of pear-shaped bowl made of walnut tree slices (up to 20), short fret-free fingerboard and top hooked to the back. Resonator holes are made to assure good sound on wood. In the bottom of the cover there is barrow to which strings are directly tied. It has 5 doubled strings. An additional string is tied sometimes. 1st and 2nd double strings are made of bowels, others of metal. Dambur, 2-string instrument made of lime tree widespread in Zagatala and Balakan districts, has a scoop-shaped long body. 5 wooden frets are tied to shorter fingerboard. Metal strings, which were made of silk before, are sounded with fingers. String instruments played with mediator were more popular in Middle Ages. According to Kitabi-Dede Gorgud, gopuz was favorite instrument of ozans, ancestors of present ashygs. Gopuz with 2-3 strings was much alike saz. Berbetin was similar to oud and a bit larger. Tune of oud was basis for tuning of other instruments. Gashgar lute and tenbur that are used now in Central Asia were popular in Azerbaijan. Tenbur had kinds such as dutar, setar, chartar, penjtar, sheshtar. Bowl of 3-string ozan, which was like hump tenbur, was covered with skin basically. Sheshkhana, invented by mugham singer Rzaeddin Shirvani, was much like oud. One of instruments like oud was sheshtay and 8-9-string chekhes. Chang, widely used in Azerbaijan in Middle Ages, was a favorite instrument of singers, musicians, poets. Beside chang with an arched body, triangular and quadrangle-shaped chang and nuzhet, which were sounded with special sticks, were used. Nuzhe and mughnu, invented by prominent music expert Safiaddin Urmavi, were used in Azerbaijan. Nuzhe was made in base of chang and ganun. The quadrangle-shaped instrument had 81 strings. 33-string mughnu was much similar to lute, but was larger. 96-string santur, with a body consisted of trapezium-like box and played with sticks, was used in Azerbaijan in the near past. Among instruments played with a bow of horsehair, chegane, cheganag and keman were popular in Azerbaijan. Chegane, which had a pear-shaped bowl and 2 or 3 strings, was leaned on the floor by its stand. 3-string cheganag had a sieve-like bowl. Keman reminded of a violin. Balaban, one of the ancient wind instruments our ancestors left to us, is played in all corners of Azerbaijan. Ksula is used in north and northwest Azerbaijan, yan pipe and tulum in Nakhchyvan. Zurna (gara zurna as well), one of the most ancient instruments of our nation, had 5 kinds in Sheki region for length of body and sound: main and medium large, which is used now, small, medium and foot small. 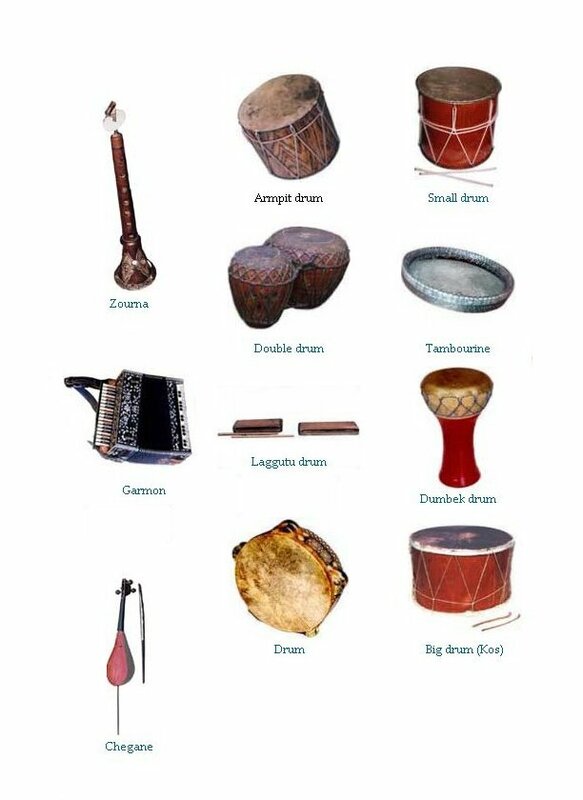 Zurna is combined of body (kotuk, karkhana), billow, key and reel. Body, made of dry apricot tree, has 8 music holes on the surface and 1 on the back. Diameter of body gets shape of cone enlarging from the 6th hole. Hole in wide foot is always open. Forked ‘tongs’ made of wild willow is placed in the body from the top. Billow made of bronze and copper is linked to that. Cane ‘key’ is tied to the bottom end of the billow. Round ‘reel’ made of mother-of-pearl or bone is connected to the billow. During performance, lip touches that. After performance, key is capped. Balaban, which is often called also yasti (flat) balaban for flat mouthpiece and soft sound, consists of body made of apricot tree, cane, barrow and cover. Body has 8 holes on the surface and 1 on the back in the middle of 1st and 2nd holes (sound fret) on the surface. Fife is made of cane basically. The lower end of cylindric body (280-350 mm in length, 20 mm in diameter) is a bit hewed, the head is cut aslant and wood is placed inside. On the surface of the head there is a quadratic hole with metal ring to adjust sound. Body has 7 holes on the surface and 1 on the back. Ney, consisted of straight cylindric, empty body, is made of apricot tree, date-palm or copper. To assure good sound the upper end of the instrument is a bit hewed. Body has 5-7 music holes on the lower surface and 1 on the back towards the top. Shield accordion (more famous as Azerbaijani or Eastern accordion) and clarinet are widely used by musicians. Wind instruments that were popular in Azerbaijan in Middle Ages include burghu, long instrument expanded towards the bottom, bugh, short with a pretty large top, musigar, consisted of 8 pipes of different length, kerenayi, 2m in length, expanded towards the bottom, nefir, a horn instrument consisted of long, straight tube and with a bit large top, gavdum with a wrapped pipe, shahnefir, the bend kind of nefir, mizmar, similar to fife, nay with a sharp sound. Erghan, the ancestor of modern organ, was made of numerous tubes and played with bellows. Sumsu, the primitive type of fife, sumsu-balaban, bird-like burbugh and kelenay (kelezurna) were used in the near past. Shapbyr-balaban is rarely played now. Gaval, which was called ‘the most delicate’ of percussion instruments by Uzeyir Haibeyov, naghara, goshanaghara, dumbek are very popular at present. Gaval is consisted of narrow, round wooden rim. One side of gaval is open, another side covered with fish skin. Metal rings are fastened to the rim from inside. Diameter is 340-456 mm, width 40-50 mm. Gaval is played by touching palms and fingers of both hands on the side or centre of the skin surface, also shaking the instrument. Naghara, made of apricot, walnut, mulberry and lime trees, has a cylinder-like frame. Steel hoop covered with goat skin is stretched to both sides by crosswise revolved rope. According to the size of the body it has various names such kos, the big one played with a small type, goltug, manual naghara, bala naghara. Big naghara is played with 2 beetles, others by hand and sticks. 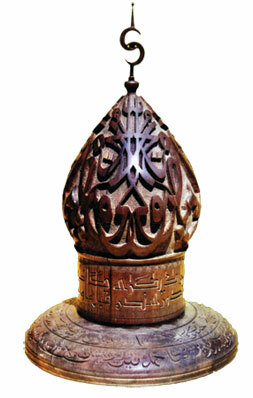 Goshanaghara (dumbul, dumbelek as well) is comprised of the body made of 2 walnut, mulberry trees of the same height, but different size and metal. It reminds of cup. Skin of goat, camel or horse covered on the surface of the body is stretched by screw mechanism. Different sounds are obtained by touching sticks separately on both surfaces, on one surface (center and side), on each other or on the body, touching the palm on the surface. The cup-shaped body of dumbey was made of clay before, now of wood basically, wide surface is covered with goat skin and stretched by strap or screw mechanism. Height of the instrument, which is played like gaval, is 350-400 mm. Drum, the cup-like instrument played with sticks, was popular in middle ages. Body was made of copper or bronze, open side coated with wolfskin. Its small type used in hunting was called drum-bass. Kus, larger than drum, was played via sticks with crooked ends or covered with cloth. Consisted of 2 big drums, juft-kos was played in battles usually. Tambourine was similar to modern gaval. 4-6 copper circles were fastened along its rim. Sometimes circles were replaced with small rings tied to external and internal sides of rim. This instrument was called circle. Mezher had a wide rim to which rings, bells were fastened. Davul, mentioned in Kitabi-Dede Gorgud epos, reminded of big naghara. Diameter of body of tebire was diminished towards the middle. Both sides of dumbul’s rim were broad. Nagharazan was similar to one-sided naghara, duhul like longish naghara. Self-sounding instruments shakhshakh, kaman, lagguti. Shakhshakh (chalpara) consists of 2 wooden round plates (bowl) tied via string to the top of handle. Shaking the instrument by handle, they sound touching each other. The 400-mm wooden part of kaman is crooked like a bow. Metal plates, rings and bells are fastened to its entry made of string, their ends are linked to the ends of the stick. By shaking yallibashy and striking blows on that rhythm of dance is kept. Lagguti consists of 2 wooden flat beams different in size. Deep resonator cracks have been hewed along their long side. 2 sticks are used to play the instrument. Instruments such as sinj, deray (in military marches basically), jeres (during migration, by dancers), bracelet-like khelkhal (by dancers), zeng, gymro, kase, aghyz-gopuzu, zyngyrov, chan, tesht, safail, gashyghek, zil have been used in Azerbaijan. Our traditional musical instruments form different musician bands. Sazende, the mugham ‘trio’ of singer, playing gaval, tar player and kaman player, bands of saz player girls playing small saz, ashygs, naghara and zurna players, balaban players, dambur players, tulum players, naghara players were very popular. Our composers have concert, sonata, piece and other works for tar, kaman, saz, ganun, balaban, zurna. Mejnun Kerimov, the candidate of art study, Honor Artist, has carried out large-scale studies to restore the instruments neglected and include them in ensembles again. A number of instruments such as rud, lute, berbet, cheng, gopuz, choghur, cheghane, Shirvan’s tenbur, santur, nuzhe have already been restored. Candidate of art study Abbasgulu Najafov has also joined this mission. An ensemble has been formed of the musical instruments restored. The art of mugham is an important branch of verbal heritage of the culture of Azerbaijan professional music. It has deep roots in cultural traditions and history of Azerbaijan people. Great number of followers of this cultural tradition in the country, and an important role it plays in the national culture as a source of endless enthusiasm for the composers, painters, sculptors and poets of speak about the basis of this culture in Azerbaijan. Several common features relate Azerbaijani mugham with Iran destgahs, Uzbek and Tajik shashkoms, Uygur mukams, India ragas, Arabian nubas and Turkish tegsims. They comprise the common artistic traditions of the oriental music. The art of mugham is one of the main cultural wealth that forms the basis for national self-consciousness and self-identification of the Azerbaijanis. This kind of art is also famous among the Talishes, the mountain the Jewess, the Armenians, the Lezgins, the Georgians, the Avars and other ethnic groups living in the territory of Azerbaijan. Artistic values of Azerbaijani mugham for national culture and the culture of the whole world and its high sense acknowledged by highly authorized international organization YUNESKO in 2003.YUNESKO appreciated mugham as ‘one of the masterpieces of the verbal and non-material heritage of the world’. The term ‘mugham’ in Azerbaijan music also means the categories of fret, melody and genre. In the meaning of ‘fret’ the term ‘mugham’ is used at least 700 years. In the booklet of the prominent theoretician, performer and composer of Azerbaijani music Abdulgadir Maragai lived in the 14th century, mugham is applied to 12 main frets wide spread in the music of the Near and the Middle East (Buselik, Neva, Ushshag, Irag, Isfahan, Zirafkend, Bozurg,Rehavi, Huseyni and Hijaz). Today mugham is not only the main 7 melodies in Azerbaijani music (Rast, Shur, Segah, Chahargah, Bayati-Shiraz, Humayun, Shushter)but also a number of tonic variants (Mahur, Dugah, Bayati-Gajar, Kharic Segah, Orta Segah, Mirza Huseyn Segahi, Yetim Segah, etc.). Thus in its wide meaning the term ‘mugham’ is also applied to the main subclasses of the main frets and generally reflect them as fret. Melodies with free measure in modern life of Azerbaijan music are also called ‘mugham’. In spite of the fact that the traditional repertoire of mugham comprises different types, i.e. the melodies without any measure or improvised melodies (‘bahrsiz hava’), melodies with tact measure(‘bahrli hava’) and melodies of mixed types of the measure (‘garishig bahrli hava’),when a singer is asked to perform a mugham he surely understands ‘bahrsiz hava’. The wide spread idea is that melodic style of mugham derived from the traditional reading of Koran, but according to the opinion of some scientists it is alike the traditions of anthem performing of Avesta. The opinions differ on one hand and overlap in sacral character of mugham on the other. Mugham is the general name of the largest genre of traditional Azerbaijan music and is applied to all of its forms. Nevertheless they all carry their own names. Main forms of music representing this genre are destgah (vocal-instrumental or instrumental), mugham (vocal-instrumental, solo-instrumental and solo-vocal) and zerbi-mugham. The largest for the volume and literary idea among the forms of mugham in Azerbaijan music is destgah. Vocal-instrumental destgahs (the earliest variety of the destgah) widely spread in Shusha, Shamakhi, Baku, Ganja, Lenkeran and Sheki cities of Azerbaijan in the 19th century. Mir Mohsun Nevvab Garabagi gave first scientific description of mugham in the booklet ‘Vuzuhul-erqam'(1884). Despite of the fact the destgahs had stable principles of form till 20th of the 20th century. The same destgah might be performed differently by mugham schools of Garabag, Baku and Shamakhi. In 1922 teaching of mugham included in to the curriculum of the first European type musical school established in Baku. Construction of the curriculum caused reforms in the structure of Azerbaijan destgahs and the relative unification of traditional district schools. According to the request of Uzeyir Hajibayov (1885-1948) a group of the prominent musicians (Mirza Faraj Rzayev, Mirza Mansur Mansurov, Ahmed khan Bakikhanov, Seyid Shushunski, Zulfi Adigozalov) worked out reduced versions of the destgahs for education. Nevertheless in 1920s and 1930s versions extended by the-that time masters existed simultaneously with the versions for education. Reduced versions started to be performed later in concerts, radio and recorded to the gramophones thus strengthening its position. Many melodies performed in Azerbaijan destgahs in the first decade of the 20th century were already forgotten in the 1960-1970s. As a musical term ‘destgah’ means ‘set or sum of the tons and steps’. The form is based on the set of the several definite melodies-‘mughams’ different in each destgah. For example, the set of the melodies in ‘Rast’ destgah is differed from the set of the frets of ‘Chahargah’ destgah. The pattern of the destgah in Azerbaijan music, i.e. composition of the fret cycle may only have the abovementioned main melodies and their tonal variants. The main difference between the forms of destgah and that of mugham is that the musical pattern of the destgah comprises several various mugham- fret system, while mugham is composed of the musical composition of one mugham-fret with all the possible tonal varieties. Destgah and mugham also differ in their volumes. (Rahab mugham is an exception here, as in the process of its historical evolution it changed from destgah to mugham and in some degree preserved the principles of the fret and composition of the destgah.). Vocal-instrumental varieties of the compositions are performed by the group of the performers. The group is composed of a singer-khanende, playing on gaval (percussion musical instrument), tar (a musical instrument) and kamancha (a musical instrument). This group of the mugham and destgah performers is called ‘trio of mugham’ and spread in Azerbaijan since the late 19th century. There exist larger groups of performers, too. Performance of the destgah by one soloist-khanende (singer) has widely spread in the practice of Azerbaijan music during the recent times. Vocal-instrumental destgah is composed of standard musical measure (Deramed, Tesnifs, Regler (colours)) and free verse improvising parts (Berdasht, Maye and Shohbet). There are some destgahs based on the simultaneous sequence of both melody types (Zerbi-Mugham). Practically,all the parts of the destgah, except Berdasht might be performed apart from destgah in the form of small musical forms. Each of the parts of the destgah has their definite function and form. Deramed and Berdasht are prelude instrumental plays. The third part, Maya (translated as the base, dough leaven) is the main and the largest part of each destgah. Deramed, Berdasht and Shohbet are inseparable parts of the vocal instrumental destgah; they determine its motion and logics. The Tesnifs (music type vocal instrumental melodies) and Rengler (shades) (mainly in instrumental plays supposed for dances) divide the destgah into layers and bring beauty to it. The performer is free to choose them for his/her wish, taste and the literary meaning. The rule of following of the parts in destgah is as follows: from tonic (Maya) melody rises to the highest level of the tonic and again returns to Maya; this form the stepping structure of the raise and then destgah is completed. The dramaturgy of destgah is a cycle of the changing spiritual condition of a human. The sequence of those conditions is directed to the emotional peak at each destgah. Artistic conception of the destgah takes the human through emotional cases (‘moments’) morally freeing and purifying him and embodies the idea of the moral way of human’s personality. This way is laid through gradual release of human spirit from the social ties, through separation from the outer world and interference the world of the personal feelings and experiences. Sometimes the peak of this process is the ecstatic reflection of the feelings. Then comes freedom. The art of mugham is tightly related with the classic poetry. Some of the melodies in the mughams carry the names of the forms of the poems, such as, mesnevi, saginame, semai, shehrashub, dubeyti. This shows the relation of the melodic pattern to those forms of the poetry, or even the source of those patterns. The melodies of the vocal mugham are performed by the poems of the quantitative meter fitted to the peculiarities of Azerbaijan language. Gazal, a genre of the classical poetry is the main form of the poems performed in mughams. The singers of the past prefer the gazals of the middle age Azerbaijani poets, such as Nizami Ganjavi and Khagani Shirvani (12th centiry), Imadeddin Nasimi(14th century),Shah Ismail Khatai and Mahammad Fuzuli (16th century), Molla Panah Vagif (18th century), Khurshid banu Natavan and Seyid Ezim Shirvani (19th century).The singers of the modern period mainly prefer the gazals of Aliaga Vahid(20th century), the latter classic poet of Azerbaijan. Alongside with the gazal it is possible to use in mughams (especially in zerbi-mughams) national poems in the forms of goshma or bayati. Singer is free to choose the kind of the poem, but he should take into consideration the melodic peculiarities of the mugham he performs. For instance, gazals chosen for ‘Rast’ mugham that have positive emotive shades would not fit to ‘Humayun’ mugham, that according to the description of U.Hajibeyov carries the shades of ‘deep sadness’ or to ‘Shushter’ mugham mainly performed at religious or mourning ceremonies. Till the early 20th century Azerbaijani khanendes (singers) followed the tradition to perform the mugham with Persian poems. The tradition broken by the prominent Azerbaijani khanende Jabbar Garyagdioglu (1861-1944); foundered the tradition to perform the mughams in Azerbaijani language. This tradition was popular not in Azerbaijan, but also in the South Caucasus. Among the instrumental varieties of the mugham have the same structure and the principles of extension of the form as in the vocal-instrumental varieties. The difference is that Deramed, Berdasht and Tesnifs are not performed in the instrumental compositions. Instrumental kinds of the mugham widely spread at early 20th centuries when new talented instrumentalists appeared in Azerbaijan and developed instrumental performance. Particular role in the process plaid the changes made on the tar (musical instrument) by Mirza Sadig Asad oglu. Once brought to Azerbaijan from Iran, the tar possessed stronger sound useful for the concerts. Today the destgahs might be solely performed on other traditional instruments, for example on kamancha, ud, canon (stringed), zourna, balaban, ney(breathing). Beginning with the 20th century some European instruments (clarinet, oboe, accordion) penetrated the traditional music and performance of mugham on them is appreciated by the audience as authentic. Both the vocal-instrumental and instrumental varieties of the genre might be performed both in the form of melody cycle (destgah) or in one-part melodic improvisation in one fret. Small mughams (vocal-instrumental and instrumental)-‘Rahab’, ‘Gatar’, ‘Shahnaz’, ‘Sarenj’, ‘Bayati-Kurd’, ‘Neva’, ‘Deshti’, ‘Hijaz’, etc. in comparison with the other destgahs are free musical compositions of smaller volume. If tesnifs may comprise from 5 to 10-12 subdivisions, with the exception of the tesnifs and the shades, mughams are generally composed of about 3 subdivisions. The only mugham that have more than 5 divisions is ‘Rahab’. Vocal mugham (without instrumental accompaniment) is performed in the ceremonies or in mourning, and is performed by the gazals and gasidaz written in religious or mourning character. Zerbi-mughams (rhythmic mughams) are composed of one-part vocal-instrumental composition performed within one fret and referred to the group of the small independent forms of mugham.18 samples of this mugham used in the 19th century are preserved in ‘Garabag shikestesi’, ‘Shirvan shikestesi’, ‘Kesme shikeste’, ‘Zerbi-Simayi-Shems’, ‘Zerbi-Mensuriyye’, ‘Arazbari’, ‘Ovshari’, ‘Maani’ and ‘Heyrati’. The characteristic feature of those compositions is co-ordination of the independent in measure vocal melodies (usually of high register) with rhythmic instrumental accompaniment. There are totally instrumental patterns (‘Heydari’) of this genre that are kept within the frames in definite measure (‘bahri hava’). Literary and musical societies established in Azerbaijan cities beginning from 20thsof the 19th century to the beginning of the 20th century played great role in extension of mugam performance and gave it professional shape. The most famous among them were ‘Mejlisi-Feramushan’, ‘Mejlisi-Uns’, ‘Society of mucisians’ in Shusha, ‘Beytus-safa’ and musical society of Mahmud aga in Shamakhi,’Majma-ush-suara’ in Baku, ‘Divani-hikmet’ in Ganja, ‘Anjuman-Ush-shuara’ in Ordubad, ‘Fovjul-fusaha’ in Lenkeran. The poems, literary men, musicians, intellectuals, experts and connoisseurs of the classical poetry and music gathered in those societies, carefully listened to mughams, made discussions around tender performance of the music and the poem. In the 19th century the society was one of the main forms where mugham performed before the auditory. Concert form of musical performance at early 20th century and democratization of Azerbaijan music caused disappearance of those societies. The societies formed tasteful, understanding auditory level (‘the society of the wise’) that required particular culture and careful listening of the mugam as well as its high artistic performance. At late 19th and early 20th centuries the societies stimulated professional perfection of Azerbaijan musicians. The school of rovzakhanlar (performers of musical repertoire in the ceremonies) under the mosques also carried some educational importance. The boys with good voice were taught here perfect performance of mughams and correct pronunciation of the classical poems. Till the 20s of the 20th century those schools were the only educational institutions that served professional perfection of mugham performers. Since 20s of the 20th century-in the Soviet Period, musical education, as well as the education of mugham in Azerbaijan crossed 3 steps: secondary school-technical school-conservatoire. Thus the process of teaching mugham formally takes 14-15 years. According to the opinions of mugham performers, professional perfection is achieved not less than in 5-10 years of the professional training. To master mugham and to become the professional of his/her profession the performer needs 20-25 years. Such higher level of the requirements raises mugham to the level of professional art of verbal tradition. The art of mugham performance requires the performer special musical memory and comprehension, capability of improvising, talent of composing. Professional musician should know all the mugham repertoires, be able to perform before the audience without repetition. Khanende should know the classical poetry and the measures of eruz, the range of his/her voice should not be less than two octaves. The instrumentalist (sazende) should be able to perform mugham in different solo and accompanied versions. Mugham performer possessing all the abovementioned peculiarities is called a master. The process of mugham teaching was and is realized in the form of the repetitions started by the teacher and continued by the student. The teacher performs parts from the melody and the student repeats till strengthening in the mind, the process goes on with the following fragment of the melody. In majority of the cases the students use the compact disks with the melody that they learn. They also use Dictaphones to write the melody they learn and the advices of their teachers. The culture of mugham performance formed of the creative achievements of the prominent musicians- the heritages of the khanendes and sazendez famous in all the Caucasus and Iran. The great khanendez of the past were Mirza Sattar, Haji Husu, Meshedi Isi, Ebulhasan khan Azer Igbal, Mirza Mukhtar Mammadzadeh, Jabbar Garyagdi oglu, Alesker Abdullayev, Abdulbagi Zulalov, Agasaid Agabalaoglu, Mirtagi Mirbabayev, Majid Behbudov, Kechesi oglu Mahammad, Islam Abdullayev, Meshedi Mammad Farzaliyev, Huseyngulu Sarabski, Seyid and Khan Shushinskis, Bulbul and Zulfu Adigozalov, the prominent sazendez(instrumentalists) of the past tar players Mirza Sadig Asad oglu, Mirza Faraj Rzayev, Meshedi Jamil Amirov, Shirin Akhundov, Meshedi Zeynal Hagverdiyev, Mirza Mansur Mansurov, Gurban Pirimov, brothers Bakikhanovs , Pasha Aliyev and Firuz Alizadeh,kamancha players Ismail Talishinsli, Gilman Salahov, the prominent clarinet players Abutalib Yusifov, Kamranbeyim, Ehed Aliyev, Kerbalayi Letif, Teyyub Demirov and the zourna player Ali Kerimov. In the Soviet period the art of mugham was preserved by the khanendes Abulfat Aliyev, Gulu Asgarov, Nariman Aliyev, Hagigat Rzayeva, Yaver Kelenterli,Zehra Rahimova, Jahan Talishinskaya, Fatma Mehraliyeva, Rubaba Muradova, Shovket Alekberova, Tohfa Aliyeva, Hajibaba Huseynov and Yagub Mammadov, the tar players Ahsan Dadashov, Bahram Mansurov, Baba Salahov, Kamil Ahmadov, Haji Mammadov, Habib Bayramov, Mammadaga Muradov, Amirulla Mammadbeyli, Khosrov Malikov, Geray Melikov, Adil Geray and Anver Mansurov, the kaman players Gilman Salahov, Talat Bakhikhanov, Elman Badalov and Adalet Vezirov, the clarinet players Latif Alitev, Abutalib Yusifov, Ahad Farzali Oglu, Meshedi Ali and Teyyub Demirov and the national music performers Nadir Akhundov, Agasef Seyidof and Firuza Zeynalova. Performers and pedagogues like the khanendes Islam Rzayev, Arif Babayev, Alibaba Mammadov, Janali Akberov, Agakhan Abdullayev, Alim Gasimov, Mansum Ibrahimov, Sakina Ismayilova, Gandab Guliyeva, Melekhanum Eyyubova, Zabit Nabizadeh, Zahid Guliyev, the tar players Agaselim Abdullayev, Vamig Mammadaliyev, Mohlet Muslumov, Firuz Aliyev, Server Ibrahimov and kaman players Habil Aliyev, Mirnazim Asadullayev, Shafiga Eyvazova and Fakhraddin Dadashov also made great contribution to Azerbaijan culture of mugham performance. Azerbaijani musicians were the first in the Moslem East who started tours to the Europe. They recorded gramophones and attracted the auditory which was non-traditional to mugham. For the first time in 1906 an English Joint-Stock Company ‘Gramophone’ recorded Azerbaijani music to gramophone records in the performance of the famous khanende Jabbar Gryagdi and other musicians of Azerbaijan. In the period 1906-1914 some gramophone-recording studios, as well as French company ‘Brothers Pate’, Germanic Joint-Stock Company ‘Sport- Record’, Russian companies ‘Extraphone’, ‘Concert-Record’, ‘Monarc-Record’, ‘Gramophone-Record’ and ‘Premier- Record’ issued tens of records with Azerbaijani mughams, tesnifs and colours(shades). After the establishment of the Soviet regime in Azerbaijan, particularly beginning with 1930s, culture of music had completely been taken under the state control. Policy of ‘Iron barrier’ applied by the soviet state, for a long time created and obstacle for Azerbaijani music and Azerbaijani musicians to the international music market. On the first decade of the 20th century, in the period when Western auditorium interested in the culture of the East, traditional musicians of the Soviet East had for evident political situation an obstacle on their ways as well. The large place in artistic market of the West, among all the music cultures of the Moslem Middle East occupied traditional Arabic, Iran and Turkish music. Azerbaijan mugham lost its position in the foreign cultural environment and nihilist tendency expressed in evident slogans (‘down with tar!’, ‘down with mugham’) of the 20-30s of the past century gradually weakened the social status of mugham. Beginning with the 30s of the 20th century to 1970s the primitive attitude to mugham gradually strengthened its position in Azerbaijan society, but it still remained popular in part of this society. Attitude toward the art of mugham started to be changed only at 1970s, when the first international symposiums and festivals of traditional music held under YUNESKO’s support (Moscow 1971, Alma-Ata 1973, Samergend 1978, 1983) and when those processes caused the reaction in the soviet society. Thus those measures gave start to interest towards art of mugham and negative attitude toward mugham changed to highly professional art. Beginning with the 1990s art of Azerbaijan mugam attracts the attentions of the audience, specialists and the managers in the world. Traditional musicians of Azerbaijan participate at the international festivals, made tours about the world, their disks produced in the largest record-studios of the West. The art of mugham stimulated creation of the 20th century Azerbaijan composers. Beginning with 1908, when Azerbaijani composer Uzeyir Hajibeyov staged his first opera in Baku and gave the start to professional musical theatre in Azerbaijan, many new musical works created on the basis of mugham. Those are opera of mugham( brothers Uzeyir and Jeyhun Hajibeyovs and others), symphonic and chorus mughams (Fikret Emirov, Niyazi, Suleyman Alesgerov, Nzim Aliverdibeyov), sonta-mugham (Agshin Alizadeh, Nariman Mammadov), jazz-mugham (Vagif Mustafazadeh, Rafig Babayev, Azize Mustafazadeh). Growing list of works of Azerbaijani composers is based on the principles of mugham. Kechechi oglu Mahammad, Gurban Pirimov, Sasha Oganezashvili. This entry was posted on Sunday, November 18th, 2012 at 23:07	and tagged with A brief History of Azerbaijani music, آذربایجان and posted in The Music Of Azerbaijan. You can follow any responses to this entry through the RSS 2.0 feed.